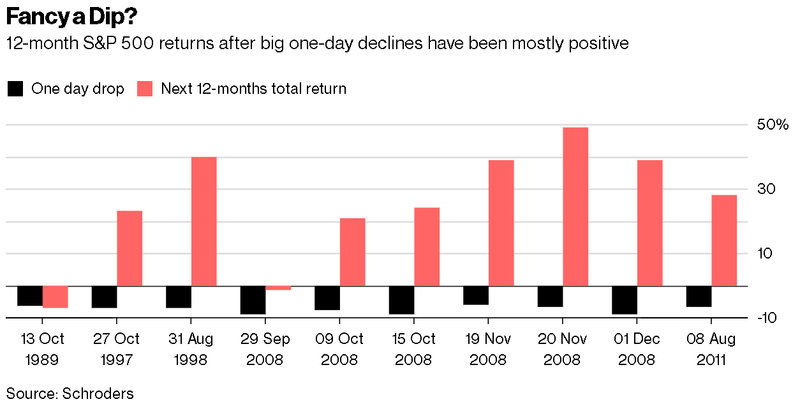 Analysis conducted by Schroders Plc shows that, after big single-day drops, 12-month S&P 500 returns have been mostly positive, according to a recent article in Bloomberg. The study reflects that, after the largest one-day stock market declines over the past 30 years, the U.S. market returned an average of 25 percent in the 12 months after the decline. In the five years following the same declines, average returns were about 14 percent, the study shows. Are Risk-Parity Funds Responsible for Recent Market Selloff?